What’s it really like to stay in a Japanese ryokan for the first time? I found it to be much like the experience of visiting Japan for the first time as a whole. It can be comfortable, delicious, rewarding, and warm. 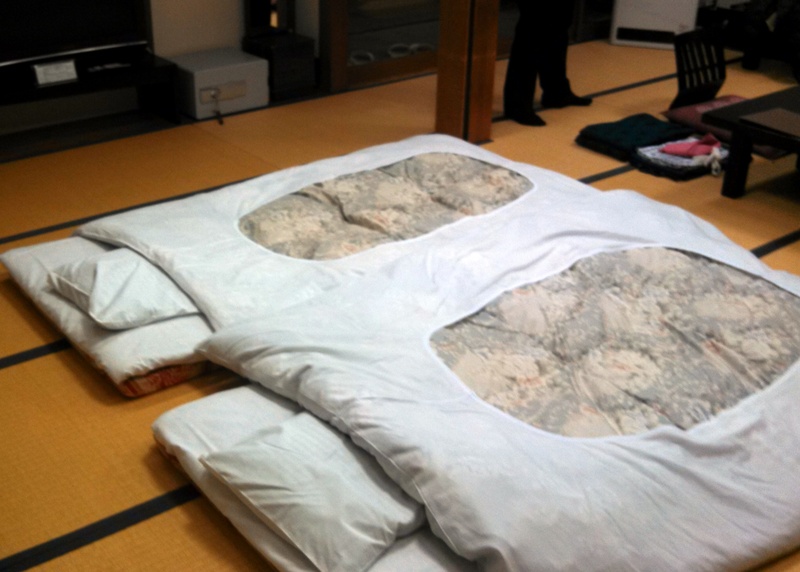 But my first experience in a ryokan was also confusing and even a little bit disappointing. As I originally planned the trip from afar (everything requires reservations in Japan), I imagined I’d book us in as many ryokans as possible. 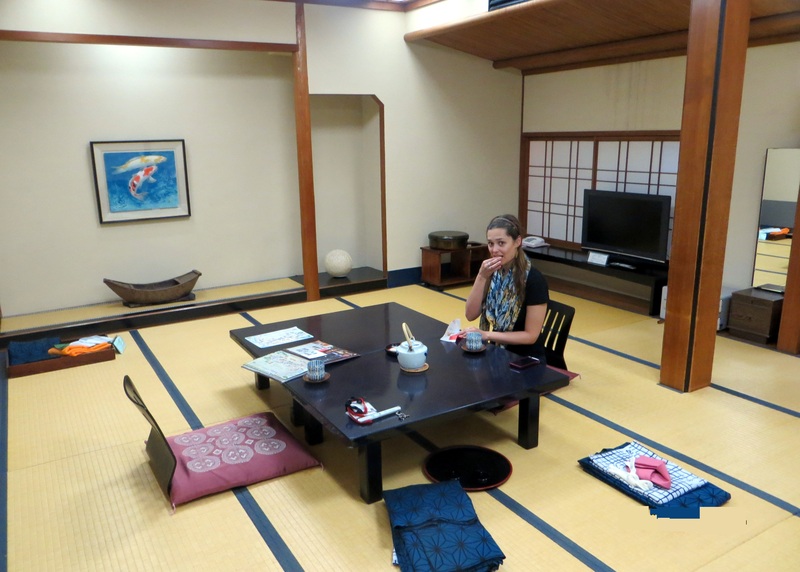 While I desperately wanted the authentic Japanese experience, in the end we wound up booking only two nights in a ryokan. This was mostly out of convenience. Many of the ryokan websites I came across were in Japanese, and a good few wanted reservations by fax. The chain and western-style hotels were much easier to reserve from the US. Plus I understood what I was getting with a Best Western or a Marriott, but had no idea what to expect from a ryokan. Wherever I go, I try my best to stay in locally owned and operated places. It’s an ethical way to travel, as it ensures the community – or at least part of it – is benefiting from your visit in some way. It’s not always possible of course, especially when travelling in a place with a massive language difference like we were experiencing in Japan. Staying in western hotels brought us a lot of comfort after long days of straining to understand. But it was well worth the extra effort to see the traditional way as well. And while sleeping on the floor might have taken some adjusting for our backs, I’m glad we did it. When we walked in to our ryokan the owners knew exactly who we were since our names were the only reservation not in Japanese characters and we were the only ones in the lobby that were clearly not Japanese. You can’t get more authentic than that. Most ryokans include (or at least offer) breakfast & dinner served to you in your room. 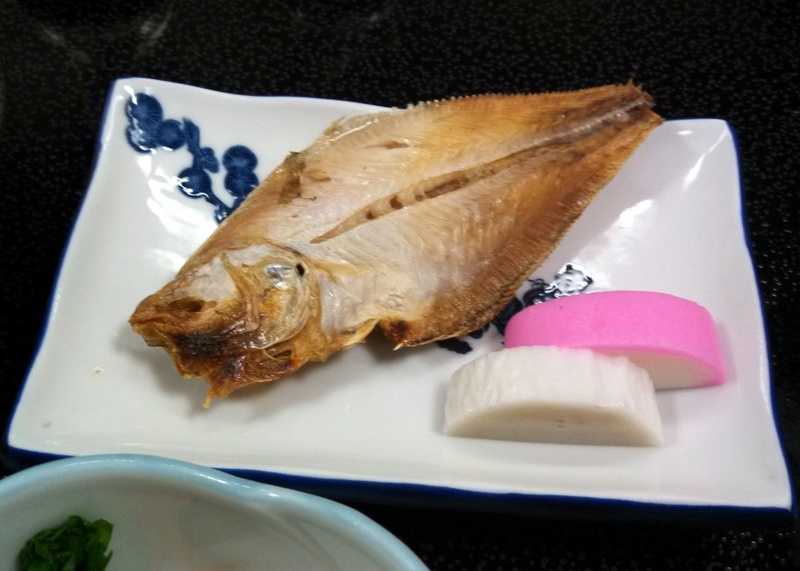 Eating in our private room seemed strangely luxurious, and I can imagine that it would be very fun if you were traveling with a larger group of family or friends (we saw many couples traveling together at our ryokan). Not to mention that many ryokans have a reputation for excellent food. 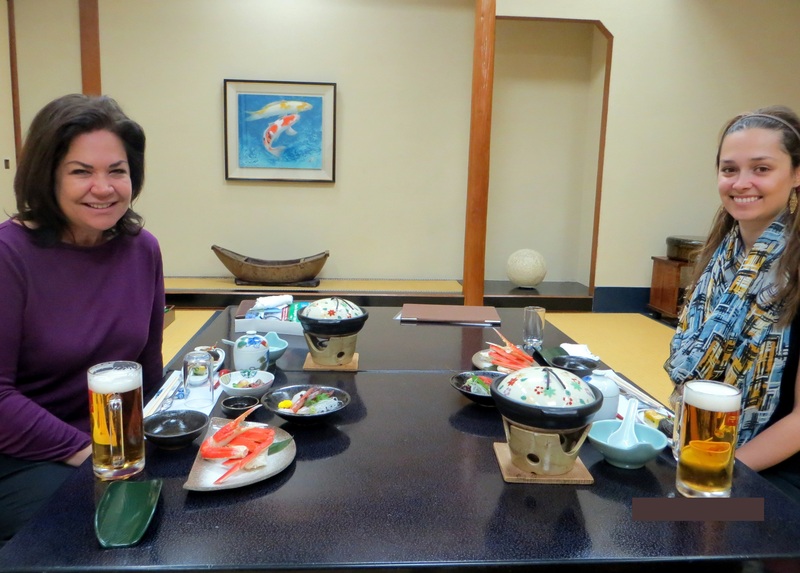 Our ryokan was also home to a craft brewery (crab beer anyone? ), and our first dinner consisted of many courses including steak, crab, and tempura. Can you say YUM!? Okay, so this isn’t a picture of an onsen. 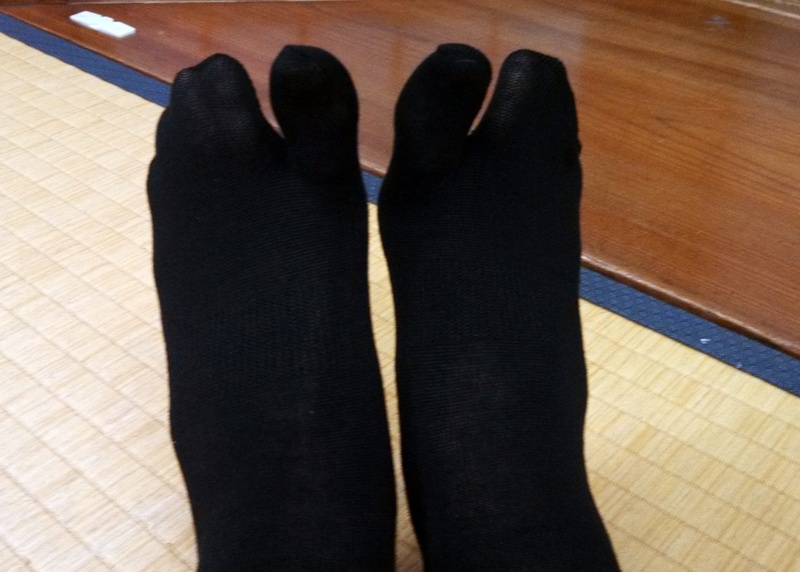 But it IS a picture of the really cool socks they gave me to walk to the onsens wearing! Many ryokans have onsens (traditional Japanese baths) onsite, or at least free passes available to one nearby. Ours had one next door that was open to guests of the ryokan 24 hours (though as you may recall, we didn’t actually use it). Upon check-in, the fellow at the desk handed us a piece of paper that asked in English to circle the times we would like breakfast and dinner served. While I was happy to eat dinner at 5, the breakfast options were limited to 8 or 8:30. Our ryokan experience took place in Kinosaki, the onsen town we had come to relax after two weeks of non-stop sight-seeing. I was a little disappointed that it didn’t seem sleeping in was an option. Oh well, I thought to myself, we can always just roll back in bed after breakfast! Even though I had circled the 8:30 option on the form, our attendant showed up at 7:55. And by showed up, I mean she opened our locked door and told us it was time to put the beds away. I tried to explain that that wouldn’t be necessary, but she responded by saying she’d return in 5 minutes. Before serving breakfast, she rolled our beds up and put them in the closet. I defiantly made a few attempts to pull them back out after breakfast, but it was as if this woman had a sixth sense for grumpy westerners who wanted to sleep more. Every time I touched the door to the closet she seemed to appear, smiling sweetly. Much to our dismay, she showed up on our second morning even earlier, at 7:30am – even though checkout wasn’t until noon! The attendant let herself in once again even though the door was locked and the lights were off. While the first morning I had rushed to the door to greet her, this time she found us still in bed. Smiling she turned on all the lights and announced it was time to put the beds away. This time we didn’t put up a fight. While many ryokans serve wonderful food, there aren’t many options as far what there is to eat – whatever is being served on that day is what you get. I’ve heard it can be very difficult for picky eaters and people with specific food preferences to survive in ryokans. Our specific experience was a bit strange in that while our first dinner was spectacular, our second was much smaller in size and frankly, not that great. We actually wondered if we had somehow requested a different type of meal for the second night when we made our reservations, but when we inspected our bill upon checkout, we found the price to be exactly the same for both dinners. Had I the ability to communicate, I might have complained. I continue to wonder if something was lost in translation. 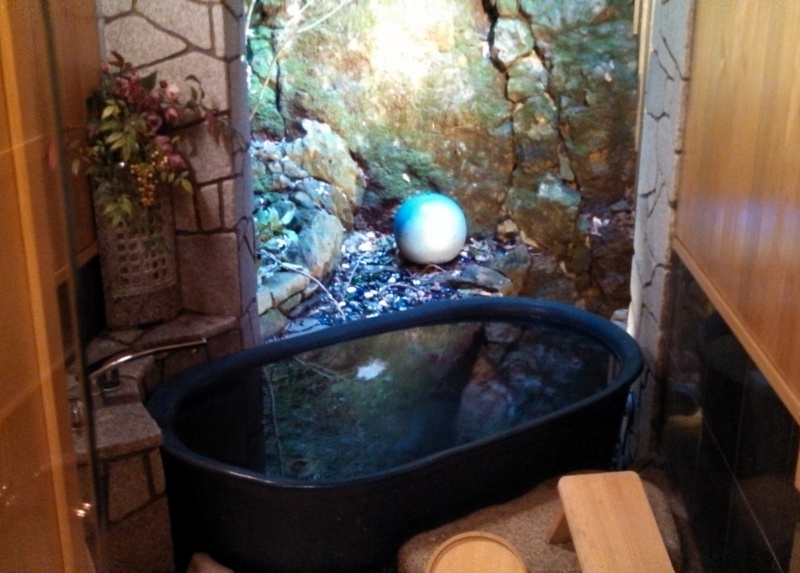 Perhaps because most ryokans have onsens onsite or nearby, many don’t have showers or baths in the rooms themselves. 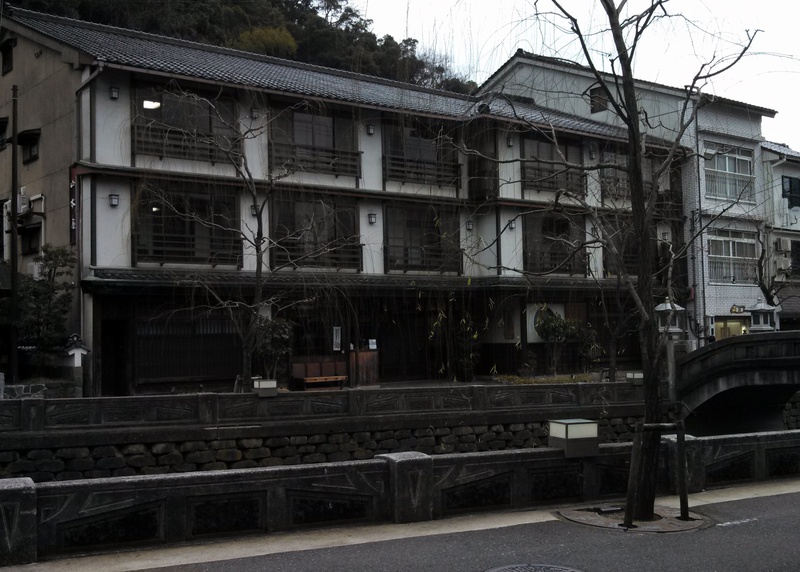 This was the case with the ryokan where we stayed in Kinosaki. So if you want to clean yourself, you’ll have to do it the Japanese way: publicly. Our ryokan did have a private bath you could reserve (pictured above), but it cost extra and when you could go was based on availability. Sidenote: we were told the private onsens for rent were for two. By American standards, you have to really, really like the person you’re bathing with to be comfortable together in that tub. Overall, I’m really glad we stayed in a ryokan for two nights of our trip. But I was also really glad we stayed in western hotels the rest of the time. My advice to anyone visiting Japan from the west for the first time would be to absolutely stay in one of these traditional inns. They are a custom specific to Japan and definitely worth exploring. But also allow yourself the luxury of western lodging. While the experience may not seem as ‘authentic’, it will probably be more comfortable – especially if you’re traveling for several weeks like we were. For mom and I, having a place to rest our heads at the end of the day that didn’t seem completely foreign was necessary for our stamina. And that was valuable too. ” and a good few wanted reservations by fax” … oh … You were not able to do that because you expected the world goes your way, like facebooktwitterwhatsarse, and they have to obey your customs in the rest of the world? 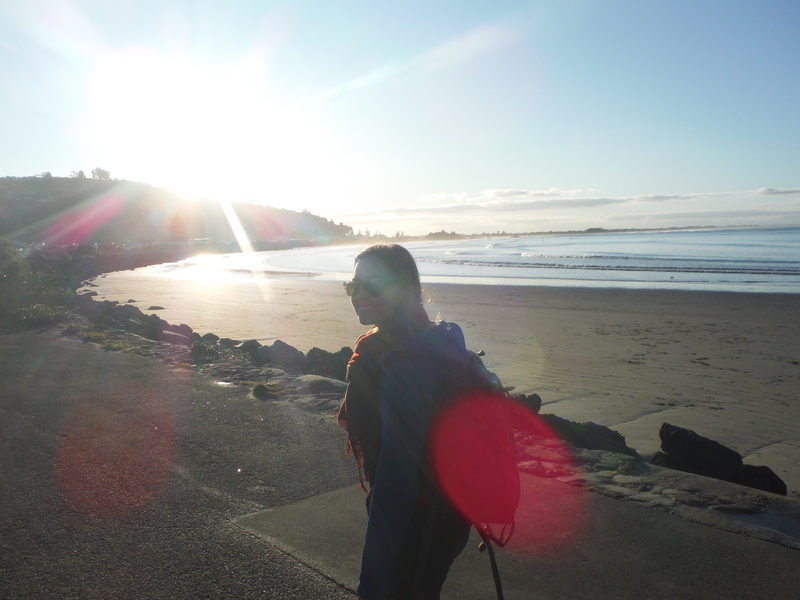 You only experience a different country when you live like the locals do, comfort or not. Not with your comfort you are used to from home. And even more important, learn at least some of their language before you go there. Sorry World Traveler… I don’t see any place in this post where I state that I expect the world to go my way… Yes, I note the differences between Japan and my home country in these posts, but I do that to inform similar travelers in order to help them anticipate the differences so that they can plan better, that’s all. Also, I don’t see the sin in mentioning that many ryokans only took reservations by fax. Where I am from it is not common for people to have fax machines in their home. It’s simply an issue of access – I don’t have access to a fax machine at my home or work so it is difficult for me to make reservations in that way.